With a traditional look and strong design, this vanity will help any bathroom look nicer. Made with a special white solid wood base and a white marble counter, this piece will make your bathroom look even nicer. This classic set from Wyndham Collection will make your bathroom look brand new. For some added traditional style in your bathroom, choose this beautiful vanity. The good-looking white marble counter and white solid wood base make a big difference in your bathroom. With a double-door cabinet and drawer, this vanity can hold all kinds of bathroom items. Put a classic feel in your bathroom with this good-looking set from Wyndham Collection. This vanity is a great way to add traditional style to your bathroom. The good-looking white marble counter and white solid wood base make a big difference in your bathroom. Room is no problem with this vanity because it comes with a double-door cabinet and drawer. This set from Wyndham Collection is great for anyone looking for great style and function in their bathroom. This vanity has both an all-around look and a traditional style. This piece comes with a beautiful white solid wood base and a white marble counter. There's plenty of space for items in this vanity's drawer and double-door cabinet. Bring a classic look and feel to your bathroom with this beautiful set from Wyndham Collection. Sheffield 48-inch W 3-Drawer 4-Door Freestanding Vanity in White With Marble Top in White With a traditional look and strong design, this vanity will help any bathroom look nicer. Made with a special white solid wood base and a white marble counter, this piece will make your bathroom look even nicer. This classic set from Wyndham Collection will make your bathroom look brand new. 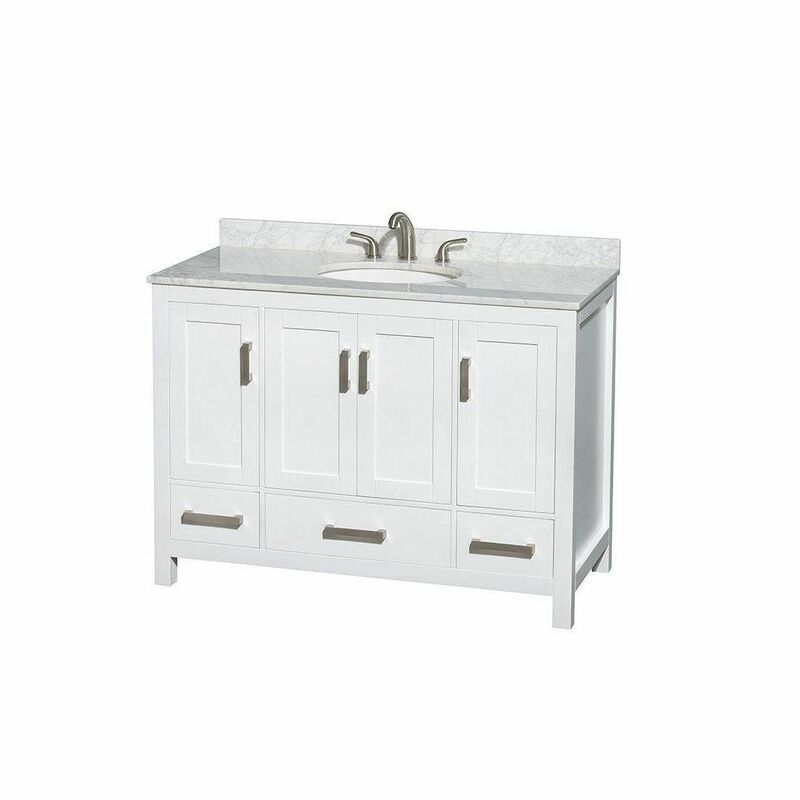 Sheffield 48-inch W 3-Drawer 4-Door Freestanding Vanity in White With Marble Top in White is rated 3.3 out of 5 by 3. Rated 1 out of 5 by Crm from The vanity is very nice and good quality. The marble... The vanity is very nice and good quality. The marble top is ugly but I am trying to work with Wyndham to get another one. They are not very customer friendly. Rated 5 out of 5 by Gary from Good price, easy to install, good quality (so far) I bought this instead of semi-custom cabinets. I'm not all that handy (understatement) and this was a breeze to install. No shims, fitting or other shenanigans. You do have to cut your own holes for water and drain. After that plop it in, stick the top on with caulking and you're done. Its heavy enough that I didn't see a need to fasten to the wall. The sink that comes with it apparent needs a larger sink flange to get a good seal so I have to replace the one that came with the faucet I bought.